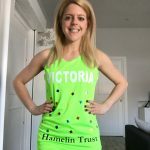 Victoria Sullivan is running the London Marathon on Sunday 28th April 2019 for Hamelin Trust. Victoria had hoped to run the marathon last year, but unfortunately an injury meant she was unable to do this. Happily Victoria was able to move her place to this years London Marathon and she is on track to take part. She has been training hard and has recently completed a 21.5 mile run, well done Victoria! !